Our surplus food heroes strike again, this time making the Metro Online. The children were interviewed during After School Club, where they were busy making cakes for a fund raiser. The team chatted away to the journalist about their project and were quite the naturals in front of the camera. Go Team! Our mini #foodwastewarrior have been having a lot of fun and entrepreneurial food waste fighting activity this winter. From creating their own wonky fruit and veg Christmas Cards to selling their wonky chutneys in Markets throughout London to hosting their own surplus dinner for the local community, they have been busy! 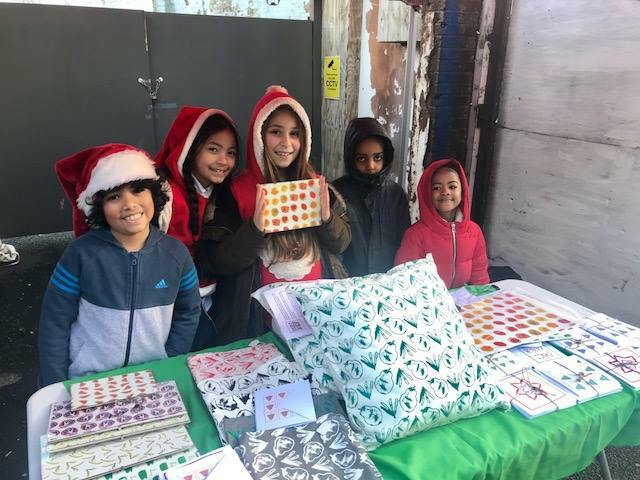 The Bubble & Squeakers at the Dutch Bank head offices in East London at their #dbmadeforgood market in December selling their Christmas Cards and Chutneys. Please note the spotty Damien Hirst behind them! This December Bubble & Squeak popped up at Shepherds Bush Market, City Hall, Aviva Bank Christmas Fair and Deutche Bank Social Market with their wonky christmas cards, artwork and Christmas Chutneys! With thanks to Hatch Entprise for connecting us to the Deutch Bank 'Made For Good' Christmas market. We also sold our chutneys at local community events over the festive period and in the school playground. It was a great experience to get out an about with our mini entreprenuers. Every one of them were fantastic at presenting their project and selling their wares with confidence. 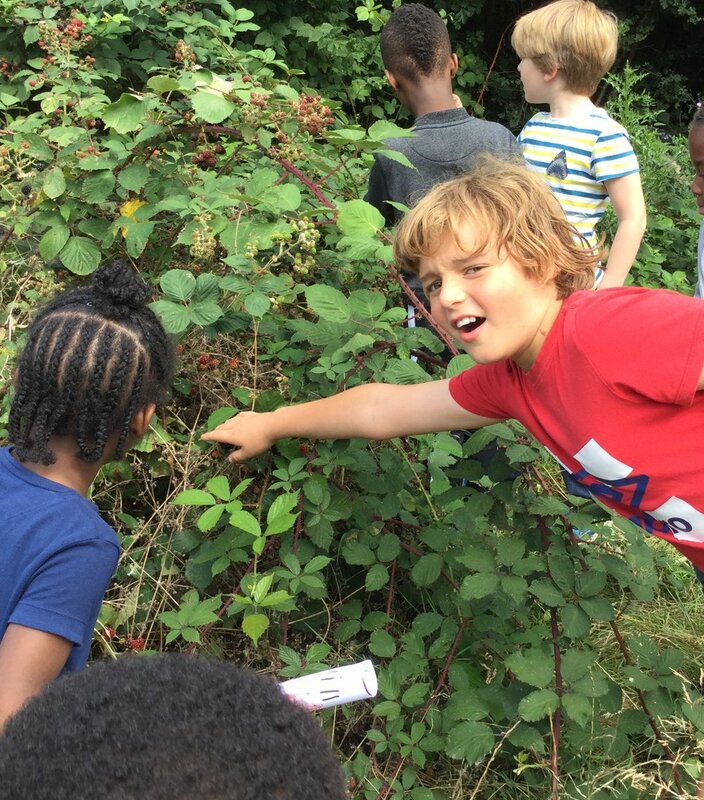 It also presented a great opportunity for the children to experience different environments outside of East Acton and speak to different people and organisations about what they do. After School Club hosted their annual Christmas Dinner in December cooking it this year with lots of delicious surplus food! The delicious 3 course dinner was eaten by Old Oak Primary School teachers, Old Oak Centre Staff parents as well as the older members of our community. The children helped to prepare, serve and of course provide an excellent customer experience to all those attending. We also had on hand our Christmas Chutneys and Christmas Cards availble to buy. The kale soup in particular was a big success. A big thanks to Plan Z Heroes and City Harvest as always for providing the extra food for the event. In December we invited the good people at Good Gym Ealing to help us deliver publicity to local residents to promote the sales of our wonky fruit and veg Christmas cards. The volunteer ran organisation is a community of runners that combines getting fit with doing good. The guys came to Old Oak Communtiy Centre in the evening and speedily posted our promotional publicity through local houses in the Old Oak area. We look forward to working with this amazing organisation again, it was great to have them down. Many of you kindly took the time to vote for us in the AVIVA Community Fund 2017. Sadly we were unsuccessful in getting through to the next round as we did not have enough vote (we hit 2074 in total). It was an interesting experience. While we think any business providing opportunities for funding like this is a great thing to do, it was a very time-consuming process for us to get people to vote. Sadly we simply did not have enough workforce or the time to reach out to everybody for us to be in with a chance. But THANK YOU if you did vote, we really appreciate it! Being such a small set up and with competition so high for grant funding in the current climate we are always on the lookout for unique ways to secure Bubble & Squeak's future, and will continue to do so! Vote for us in the Aviva Community Fund and help us win £10,000! Your vote could help us fund 12 'As Young As You Feel' intergenerational monthly meetups in 2018. Bringing together the younger and older people in our community in East Acton. The monthly events will be planned and hosted by children and catered for by us, using delicious surplus food that otherwise would have gone to waste! Head over to our project page to read the full proposal and watch our video (also above). We held our first event, a Grandparents' Tea Party this October (more about that below) and it was a great success. Its super simple to place your votes too. All you have to do is head to the Aviva page, register and start voting. You have ten free votes to play with and the projects with the most votes go through to the final Judges round, who will then decide who to award the money to. You have until the 24 October to the 21 November to get your votes in. The Aviva Community Fund (having over 6,000 projects on it) apparently have been getting 20,000 hits a minute causing mega crashes for those trying to vote. So if you've tried with no luck please keep trying - we really appreciate it. And remember please share our project page and get your friends, family and work colleagues to vote too! click here to vote for us now! On the 5th October, we held our very first intergenerational meet up! Hosted by the children, they invited their grandparents (and non-grandparents) to come along to a 'surplus food' tea party. The food was provided by us (thanks to our fantastic food partners City Harvest and Plan Z Heroes). We served tea, delicious cakes, pastries and cucumber sandwiches. The brilliant Maternity Champions from Old Oak Centre came and helped out at the event, as well as Old Oak Primary's TA's. It was our first event with over 70 older and younger people in attendance. With your help, we hope to put on much more next year! You can help us turn food waste into food magic, please vote for our Aviva Community Fund project. Remember it is entirely FREE to vote! On Friday 29 September if you happened to be in attendance at the QPR v. Fulham game you may have seen a few familiar Bubble & Squeak faces on the pitch! 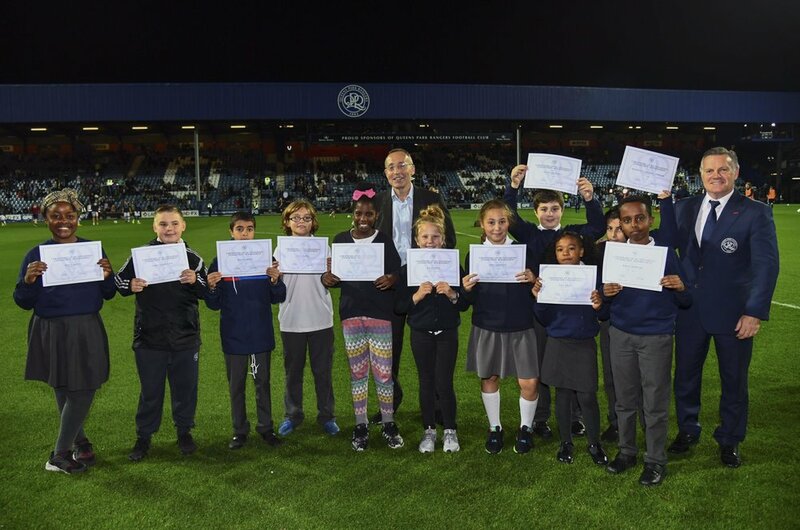 The children were invited by QPR to receive certificates of achievement for their community contribution for Bubble & Squeak before the match. 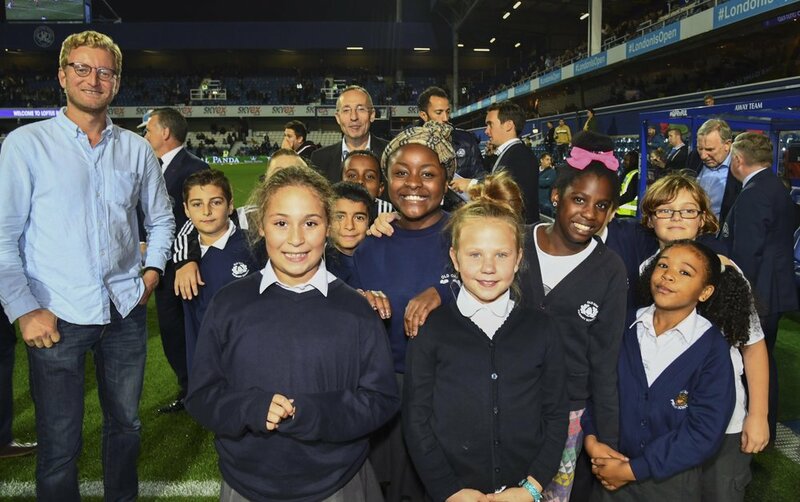 It's great that QPR wanted to celebrate the children's successes this way and as you can see by the photos what a fantastic experience it was for the children. Thanks QPR! This September the brilliant Wildlife Watch featured us in their magazine. The publication (aimed at children) has an annual readership of 150,000. Great to see our message spread so far and hopefully inspire #foodwastewarriors throughout the country. 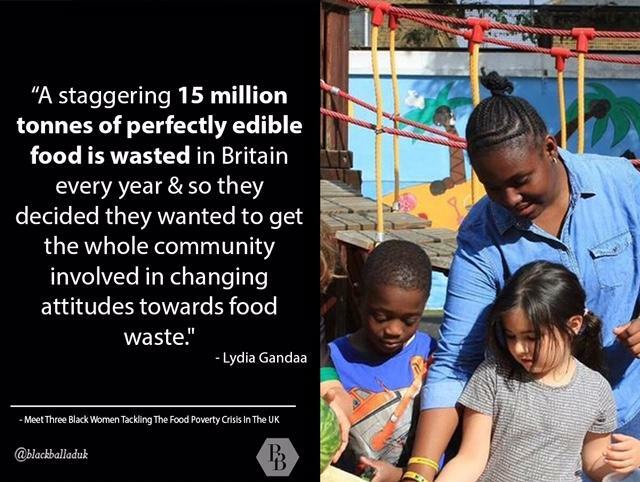 To celebrate World Food Day co-founder Lydia was featured in the online magazine Black Ballad, for their 'Meet Three Black Women Tackling The Food Poverty Crisis In The UK'. Some more Crowdfunder love! 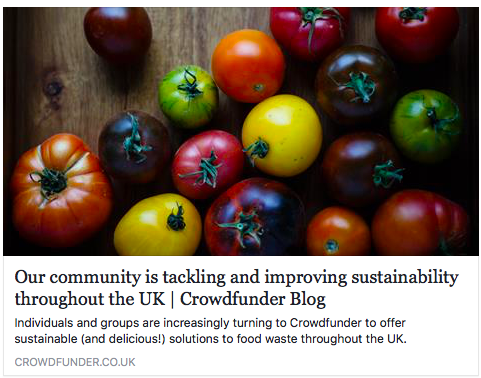 We are delighted to be listed in Crowdfunder Online's article 'Our community is tackling and improving sustainability throughout the UK'. Nestled amongst some of the most prominent UK names in the surplus food game, its great to see our idea making an impact in the crowdfunding world. Crowdfunder also asked Elly to take part in a Q&A webinar about our experience with match funding. You can watch the session on youtube. Each week during term time we are diverting on average 40 kg of produce that otherwise would have gone to waste. The children (assisted by Elly) are excellent now at setting up the tables, carrying the veg together and doing some lovely merchandising with the produce. We tried colour coding last week - very nice! Each week we also play a game of 'guess the name of the fruit and vegetable'. We go down the stall, pick up a piece of fruit or vegetable and have a go at naming it. We always come across new things we haven't seen before or know what its called. If you are local to East Acton, you may have noticed that our shipping container has been delivered. We were fortunate to obtain a local second-hand shipping container via a contact in Acton. This embraces our philosophy of keeping it local and putting perfectly good things to use. We checked out the unit, it was structurally sound, and its dimensions fitted the space at the side of the school. The fantastic Bill (site manager at Old Oak Primary School) organised the delivery over the summer (with inches to spare), organised the electrics and fitted new gates. So the unit has access to the public and a fence that makes it separate from the school. Our final hurdle is to sort out flooring, shelving and to decorate it with a suitable Bubble & Squeak design! We are keen to continue with our 'waste not want not' philosophy. So get in touch if you think you can help us! Maybe you have some shelving that's no longer needed? Or have an idea what could make it look great? We want this to serve a purpose of storing the surplus food but also be an inspiring place to be in! Oh and remember to VOTE for us! What does a Hackney pop up, a foraging tour and City Hall all have in common? From pitching at London City Hall to launching our wonky fruit/veg artwork. Bubble & Squeak have had a busy summer. In our last newsletter, we told you of our excitement at Old Oak Primary School being selected to take part in City Pitch. Making it through from 72 school projects to the final six to be invited to City Hall. Here they pitched their Bubble & Squeak surplus food idea to a dragons den style panel of industry experts! City Pitch is a great Mayor of London initiative which empowers young Londoners to step up as leaders and make a difference in their community. The experience provides pupils with the opportunity to plan and launch a social action project, whilst helping them to develop their leadership, project management, and communication skills. So on the 28th of June the #FoodForAll team aka Bubble & Squeak aka #foodwastewarriors set off to City Hall (in their branded Bubble & Squeak tshirts of course) to pitch in front of key industry specialists. After their confident #foodwastewarrior pitch the panel awarded them £1500. Well done to everyone involved. Before the break up of summer term Old Oak Primary School took a trip to City Harvest at their warehouse in Acton. City Harvest helps put surplus food to good use in a sustainable way, by distributing to organisations that feed the hungry. Bubble & Squeak have been fortunate to have City Harvest provide regular deliveries of nutritious produce for our surplus food stall and to help with our food waste education. We met with Paula who had a chat with the children about how City Harvest works, with our #foodwastewarriors doing an impromptu pitch of the Bubble & Squeak project to the team. We also helped out unloading one of their vans with surplus food and other items. The children had a great time and a particularly enjoyed wearing the high-vis City Harvest vest. Thank you to Paula and team for having us down. 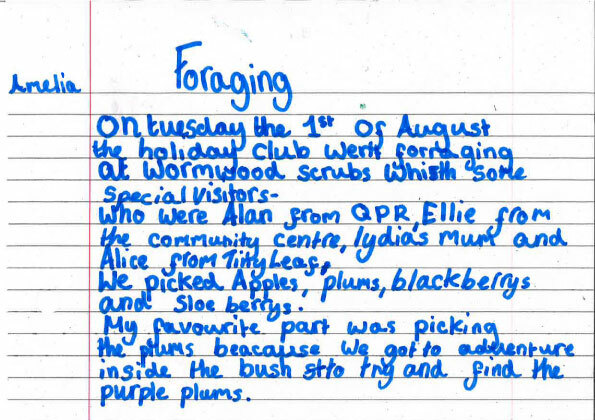 Over the summer the children hosted a foraging tour of Wormwood Scrubs to showcase their urban foraging skills. They had been learning all about edible fruits near to them that are safe to pick, eat and cook with. We were joined by Alice from Tiny Leaf (London’s first and only organic, zero waste, vegetarian restaurant) and Alan from QPR Community Trust who were given a hand-drawn map and allocated their own team of Bubble & Squeak foraging helpers! The Old Oak Summer Club’s children then took them on a guided tour along with a few other (Bubble & Squeak adult foraging enthusiasts). Armed with their foraging map also containing very important foraging rules. We visited 4 foraging fruit hotspots on the scrubs near to Old Oak Community Centre and got a great haul. Hackney Wonky Fruit and Veg Art Shop Pop UP! Since the beginning of Bubble & Squeak, the children have not only been distributing, cooking and eating the healthy surplus food but DRAWING it. Their works of foodie art have usually been created during After School Club's Let's Create sessions. We have always been massively impressed by the quality of their art work. So when we saw a competition to have a free pop up shop for a month in June at trendy Fount London in Hackney we applied with our wonky fruit and veg #zerowaste concept.... and yes you guessed it ... we only went and won it! Ensue a hectic couple of weeks transforming the children's fruit and vegetable artwork into cool repeating prints and the like. We then turned them into A3 prints, greeting cards, cushion covers and more. We sold them alongside surplus fruit brands such as Snact (who even ran a fab workshop us) Fruit Magpie, Dash Water and Spare Fruit! The store was manned by volunteers including Old Oak Primary School Teacher Vicky on her days off (thanks Vicky!). We had a great month selling our wares and chatting to lots of different people about Bubble & Squeak, who just loved the artwork and the entrepreneurial spirit of the children. It was a great opportunity to test trade our idea too. We think the pop up more than achieved its goal of showcasing the creative skills of a brilliant group of children inspired by food that would have otherwise gone to landfill. Not only that it is really exciting for us to dream big and seek entrepreneurial avenues that can support our social enterprise to be as self-sustainable as possible. We are busy working on the next collection with some exciting things in the pipeline. We will keep you posted where we will be popping up next with our #wonkyiswonderful artwork. Oh and check out our online shop where you can still purchase some of the collection! We promise we won't leave it so long until the next newsletter! Join us very soon for the next installment including those important Crowdfunding Updates (hello shipping container) a thunderclap request for our next fundraising adventure and details of the next Bubble & Squeak community event. Come to our kids cooking workshop with Snact and get creative with surplus food! We are delighted to be joining forces with Snact to run a fun creative kids cooking workshop! If you didn't know Snact make delicious fruit jerky made out of surplus fruit with compostable packaging. They also are avid foodwaste / no plastic campaigners - or as they like to call it snactivists! With such similar foodie ethos to Bubble & Squeak it was a no brainier for us to join forces with their amazing team and host this workshop at our Hackney pop up. Come along and get inspired to rethink the way you look at food you might of normally thrown in the bin whilst cooking at home. We will also be joined by the Bubble & Squeak children who are very excited to be coming over from West London. Join us on the 29 June from 11 AM - Noon. Taking place in Hackney at our pop up at Fount London, 358 - 360 Westgate Street E8 3RN. All welcome. Our winning concept was a #zerowaste lifestyle store. If your not familiar with the term #zerowaste we promise it is not as scary as it sounds! #Zerowaste is the philosophy that we can all dramatically reduce the amount of rubbish we create on a daily basis and to live in a society where resources are valued and nothing is wasted. Not wasting is one of our core messages as to why our #foodwastewarrior children run their surplus food stall in the Old Oak Primary School Playground on a weekly basis. Another core message is our Bubble & Squeak kids all have an amazing entrepreneurial spirit to use for good. So with this in mind our amazing children got busy making wonky fruit and veg art which we have turned into prints, greeting cards and cushion covers! We have some great surplus food brands for you to try such as Rubies In the Rubble and Snact. As well as some lovely children books all with an environment message and more. We are looking forward to the school term starting again so we can arrange a trip for our West London based Bubble & Squeak kids to come check out their creations. Additionally we are busy confirming a few surplus food inspired events as well to run at the shop over the month - so watch this space. Do come and say hi and support our entrepreneurial venture if your in the area. The shop is ran on volunteer time and all profits go back into our grass root work of collecting surplus food waste. Check out the pictures below and do spread the word! Find us near London Fields at Fount London, Arches 358-360, Westgate Street, London E8 3RN from the 1st June to the 2nd July. Tuesday – Friday 10.00 – 6.00, Sat / Sun 10.00 – 5.00. A group of entrepreneurial West London children are going to open a #zerowaste pop up in Hackney, East London this June 2017 to inspire Londoners to aim to live a #zerowaste lifestyle. The #zerowaste concept is the philosophy that we can all dramatically reduce the amount of rubbish we create on a daily basis and to live in a society where resources are valued and nothing is wasted. The group of youngsters (who go by the collective name Bubble & Squeak) won a competition to have a month’s free rent in a pop up shop space from Fount London. The shop will sell the children’s wonky fruit and veg artwork and homewares, as well as some great surplus food brands such as Rubies in the Rubble, Dash Water, Fruit Magpie, Snact fruit jerky and Spare Fruit Crisps. Also available will be beautifully upcycled kids dungarees in retro fabrics from Erin & Arthur and more! This unique idea will turn the space into a hub for East London to be the change they want to see in the world, sparking conversations and showcasing our children’s entrepreneurial spirit and kid magic. With arguably the topic of environmental change mainly ignored in the upcoming general election and with Londoners being told their plastic water bottle consumption is out of control the time is now to make a noise about the environment. The shop will be staffed by adult volunteers with all profits will go back into the Bubble & Squeak social enterprise, supporting our grass root work of reducing food waste. Find them near London Fields at Fount London, Arches 358-360, Westgate Street, London E8 3RN from the 1st June to the 2nd July. Tuesday – Friday 10.00 – 6.00, Sat / Sun 10.00 – 5.00. 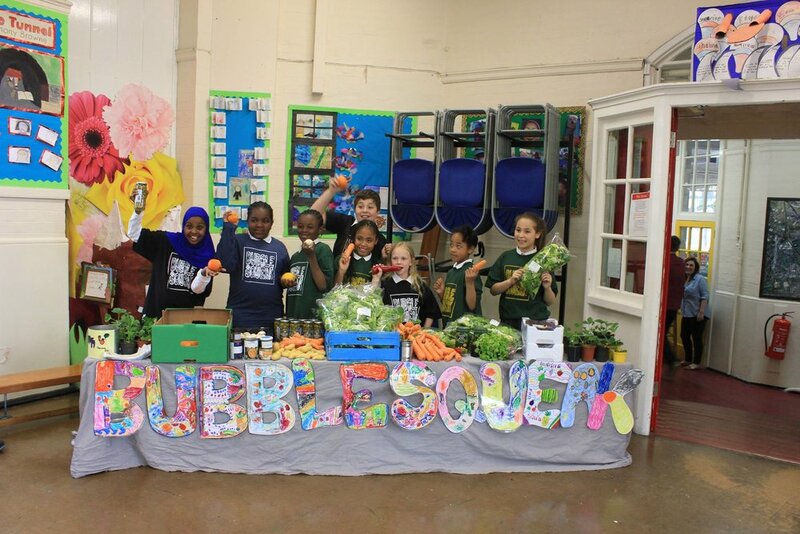 Bubble & Squeak is an award winning kids ran social enterprise based in East Acton. They collect surplus food from shops and markets and redistribute to the local East Acton community on a pay as you feel basis. Launching their first stall in February 2017 they have been featured on Time Out Online (with 87,000 + views), won Business Launchpad’s Eco Business Award 2017 and ran a successful crowdfunding campaign raising £5,564. 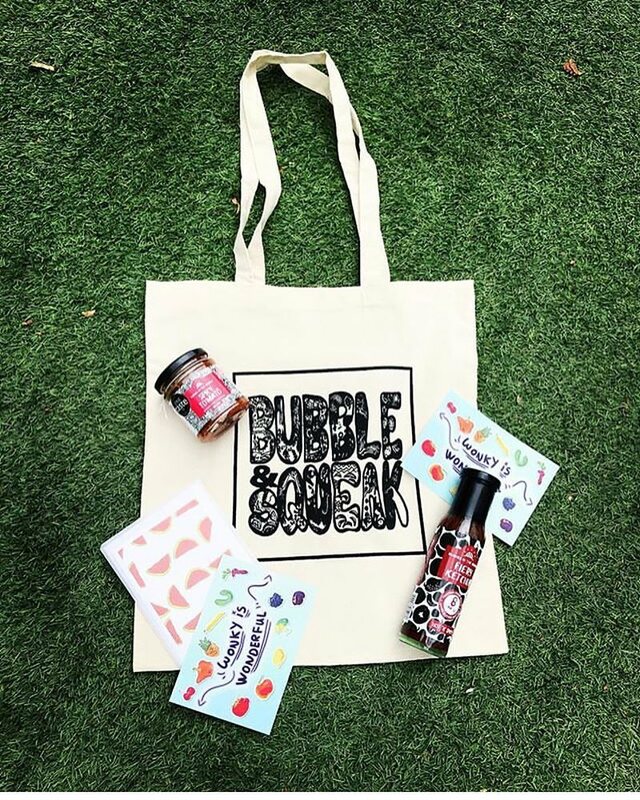 Well my oh my ... haven't we just had an exciting couple of months at Bubble & Squeak HQ! Since launching our first surplus food stall in February 2017 we have been working hard to make Bubble & Squeak a success. Here is a round up of some of our highlights so far - we hope you enjoy. You may have noticed if you follow us on social media that we are crowdfunding for a shipping container to store more surplus food. We are absolutely delighted to say we have hit the £4,500 target in just 13 days! A huge thank you to everybody that has pledged to us so far with your generous donations. The Bubble & Squeak children have truly been bowled over by your support and can't wait to grow their social enterprise. With the campaign finishing on the 23 May there is still time for us to raise funds. We have added an ambitious stretch target of £995.99 for a 1200 Litre industrial fridge. In April 2017 Bubble & Squeak picked up their their first award! Winning Best Eco Business from Business Launchpad. The Tooting based organisation supports young entrepreneurs grow their businesses. The judges said they loved Bubble & Squeak's sound ethical principles rooted in environment and sustainability. Adults and children alike had a fantastic time at our Bubble & Squeak launch party in April. A big thank you to Bubble & Squeaker Lydia for creating the event with the Bubble & Squeak children. A big thanks to all the Old Oak Primary School staff help and Holly / James from Feedback. Also special thanks to Pack'd for their delicious smoothies, Chic P for the hummus and Propercorn for our goody bag treats! On Tuesday 28th March the Year 4 and 5 Old Oak Primary children were selected out of hundreds of London schools to take part in the Mayor of London's 'Leadership Day'. Here the children came up with business solutions to improve their local environment and pitched it to the Mayors Team using a 'Dragon's Den' style approach. The winning team was the Food Waste Warriors who delivered a slick presentation about the Bubble & Squeak project. The children (with Elly) then confidently created their own video pitch which went up against 12 other schools. We found out this Wednesday the children have been selected as finalists to appear at City Hall in front of a panel of key industrial individuals. On the 28th of June they will present their project with the aim of winning £1500 towards the project. We wish the Squeakers all the best of luck! We have been continuing our core work of saving surplus food from landfill and redstributing it to local familes via our weekly food stall ran by the Bubble & Squeak kids. We now average around 35 families collecting surplus food each week and are building strong links with food waste charities. We are looking forward to expanding our stall and seeing what ideas the Bubble & Squeak children have on how together we can do this. We are always on the look out for new avenues for how to save / distribute surplus food, contacts, funding opportunities and ideas. Do get in touch with us at bubblesqueakeat@gmail.com if you think you can help.